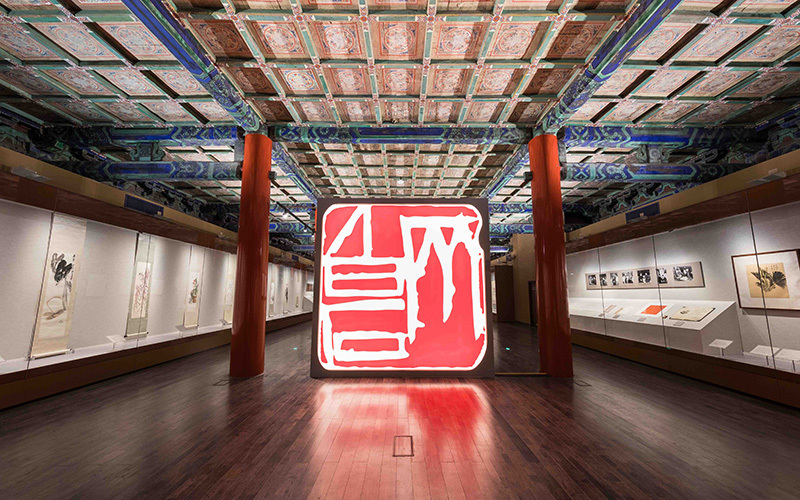 The Palace Museum and Beijing Fine Art Academy jointly present the exhibition “Prosperity in Tranquility: The Art of Qi Baishi” at the Forbidden City in the galleries of the main tower and western wing tower at the Meridian Gate (Wu Men). The exhibition features over 200 paintings, seals, and literary works by the artist Qi Baishi (1864–1957) and is divided into four sections: Diligence Rewarded by Heaven, Dreaming of Home, Increased Ambition with Age, and The Art of Seal Engraving. The gallery in the main tower gallery atop the Meridian Gate will be open until August 12 while the sections in the western wing will remain open until October 8. This exhibition is presented in tandem with an exhibition of Qi’s art at the Art Museum of the Beijing Fine Art Academy from July 20 to September 23.